Frances Slocum, also known as Weletasash and Ma-con-na-quah, “Young Bear” or “Little Bear,” was a white American Indian captive. On November 2, 1778, five-year-old Frances was kidnapped from her Pennsylvania home by Delaware Indians, along with Wareham Kingsley, a young boy whose family was living with the Slocums. She left behind her Quaker parents, Mr. and Mrs. Jonathan Slocum, and her nine siblings. Slocum was given the name, Ma-con-na-quah (Young Bear), because of her protests as she was captured. In an interview years later, Slocum said the first night of captivity she cried until she fell asleep. Upon entering the Delaware village, her hair was done up in Indian beads known as wampum beads and dressed in traditional Delaware clothing, Delaware chief, Tuck-horse, gifted Slocum to a village chief and his wife whose biological children had perished due to illness and warfare. They named her Weletasash, after their youngest daughter who had died. She was fully adopted as a member of the Delaware community, a practice that allowed the tribe to bolster its community by replacing deceased members. In 1779, the U.S. Continental Army burned her tribe’s crops, forcing her and her family to move westward. They settled in Kekionga, now present-day Fort Wayne, Indiana. Ma-con-na-quah was well-known and respected for her physical abilities within her community, excelling at foot races and horseback riding. Married in the 1790s to a Delaware Indian, Ma-con-na-quah was a victim of spousal violence. Taking advantage of Delaware custom that allowed women to return to their families in the face of ill-treatment by one’s husband, she returned to her father’s home until she married her second husband, a Miami named She-pan-can-ah (Deaf Man), who later became a Miami chief. After her adoptive father’s death, Ma-con-na-quah and her adoptive mother went to live with She-pan-can-ah’s tribe along the Mississinewa River near Peru, Indiana. She bore four children, two sons and two daughters, Kekenakushwa (Cut Finger) and Ozahshinquah (Yellow Leaf). Only her daughters survived to adulthood. She-pan-can-ah and Ma-con-na-quah established a trading post known as “Deaf Man’s Village,” about nine miles from Peru, Indiana. The village became a huge social center for both Native Americans and whites. In 1838, an Indian trader, George Ewing, told Isaac Slocum, Ma-con-na-quah’s biological brother, that there was a white woman at “Deaf Man’s Village,” who lived among the Indians. Recalling losing his sister years earlier, Isaac sought her out. Looking different than what Isaac was expecting, the “missing” Frances Slocum, had white hair and was wearing seven pairs of silver earrings. A missing left forefinger, an accident that happened to little Frances before she was captured, confirmed that Ma-con-na-quah was actually Frances Slocum. Despite a happy reunion with her brother and other members of her family, she rejected returning to Pennsylvania and white society. 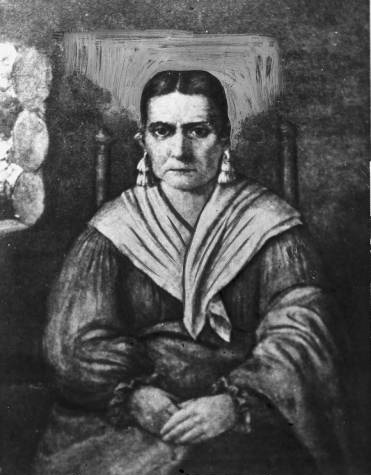 “I am used to them,” she said, “The Great Spirit has always allowed me to live with them, and I wish to live and die with them.” As a consolation to her family, Ma-con-na-quah agreed to have her portrait done by artist George Winter. Slocum’s desire to stay among the Indians, however, did not stop her from story being romanticized. After her identity was confirmed, she was painted among the white Americans as a tragic figure, a poor innocent girl who was abducted by Native Americans and longed to go home. The Slocum family used this story to garner public support for her to be returned home. This led to Slocum fighting not only for her right to live among her Miami people, but to help prevent them all from being forced to relocate westward. Her Indian family was scheduled for removal with the rest of the Miami tribe in the 1840s. In 1845, Slocum’s attorney petitioned Congress to allow Slocum to remain in Indiana. On March 3, 1845, Congress passed a joint resolution that allowed Slocum and her 21 Indian relatives to be exempted from removal. Slocum died on March 9, 1847 at the age of 74 in Indiana. She is remembered publicly both through a Pennsylvania state park and at two Indiana locations. The Pennsylvania park marks the area Slocum spent her first nights away from her first home. In Indiana, along the Mississinew River, there is a Lost Sister Trail and the Frances Slocum State Recreational Area, two locations that honor this historic figure and her perspective of the Hoosier State before and after it achieved statehood. Abigail Bragg, “Frances Slocum,” Discover Indiana, accessed April 25, 2019, https://publichistory.iupui.edu/items/show/396. 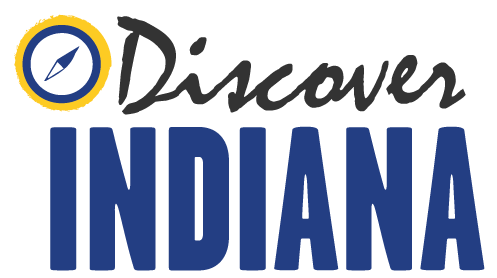 https://indianapublicmedia.org/momentofindianahistory/trail-lost-sisterfrances-slocum/ https://www.in.gov/history/markers/343.htm http://www.dcnr.pa.gov/StateParks/FindAPark/FrancesSlocumStatePark/Pages/default.aspx http://www.stateparks.com/frances_slocum_state_forest_in_indiana.html “They Found and Left Her an Indian” "The Miami Indians of Indiana"
Published on Jul 10, 2018. Last updated on Apr 2, 2019.